As with all cookies, I start by taking 50 gms butter out of the fridge and leaving it to soften. After an hour or so, cream this soft butter with 50 gms sugar. Here, I used half caster sugar and half raw brown sugar. Now add 2 tbsp milk and 1/2 tsp vanilla essence. Beat everything until light and fluffy. Mix together 120 gms flour and 1/4 tsp baking soda, then add to the bowl with butter/sugar and mix well. The batter should be fairly runny. 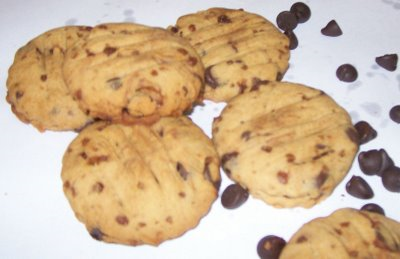 Finally, fold in 80-100 gms chocolate chips. Now wet your hands with cold water, and roll a walnut size piece of dough into a ball. Place on a greased baking tray and press with a fork to flatten. With my dough, I got 10 cookies. Preheat the oven to 190C and bake the cookies for 12-15 minutes until they are crisp and lightly browned. I left them in the baking tray for a bit, then cooled them completely on a wire rack. And then, temptation! I bit into one, and then quickly packed the rest into an airtight bowl kept out of my sight. I don't see my friend for another day, and I want these to last.